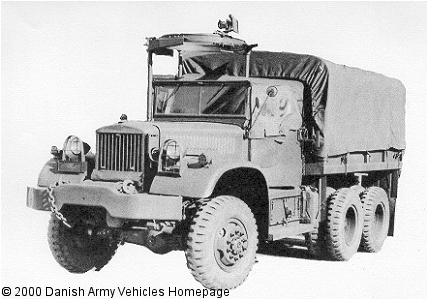 Danish Army Specific: Delivered as part of the MDAP 1951/55. Closed cab (100 kb) versions delivered as well. Historical: Design and development of the model 968 began in 1939, and it was adapted for production in 1940. Based on the Diamond T 967 and produced from 1941 to 1945. From 1943 most produced with soft-top. Total produced cargo-trucks around 9.000. Length: 6.83 m (266 inches). Width: 2.44 m (95 inches). Height: 3.05 m (118 inches). Weight: 12.100 kg (26.620 lb.). Engine: Hercules RXC 6-cylinder, 8.668 cm3 (529 cubic inches) displacement, liquid cooled, carburetor. Horsepower: 106 at 2.300 rpm. Transmission: 5-speed (OD top) gearbox. Transfer case: 2 speed, type Wisconsin T76. Electrical system: 6 volt, starter 12 volt, positive ground. Fuel capacity: 225 liter (50 gallons). Range: 215 km (134 miles). Armament: Some mounted with ringmount for 12.7 mm (cal .50) MG (shown). Additional: Some mounted with Gar Wood 3.U.615 7.5 ton winch.